On May 16, 2018, the Delta Upsilon International Fraternity Board of Directors announced the rollout of a substance-free housing policy, which will take effect Aug. 1, 2020. Letters were sent to all DUs, parents and university officials for campuses with active DU chapters. The policies are designed to create a healthy atmosphere for Building Better Men by creating safer events and living environments. Since Delta Upsilon’s founding in 1834, we have prided ourselves as being a forward-thinking organization. Time and time again, we have made decisions based not on tradition, but on the application of our Four Founding Principles toward member development. That is why Delta Upsilon is the oldest non-secret, non-hazing fraternity. That is why we are viewed as an innovator among our peers. 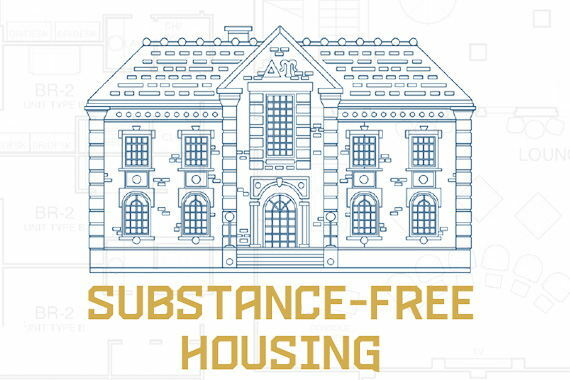 For more specifics on the policies, please view our Substance-Free Housing Overview and FAQ found at www.deltau.org/substance-free. As we have been for 184 years, Delta Upsilon is committed to serving as a positive force in the lives of our brothers and the communities we call home. Removing alcohol from our facilities sends a clear message about our purpose, values and commitment to make campuses safe for all students. Should you have questions or comments regarding the substance-free housing policy and direction of the Fraternity, please email ihq@deltau.org. The implementation of a substance-free housing policy is a pivotal moment in Delta Upsilon’s history. For decades, fraternities and alcohol consumption have been viewed as synonymous in North American culture. Alcohol abuse has become part of the fraternal community’s identity that must change for fraternities to survive. to an interest in bettering society through group action, not being the center of the campus entertainment scene. The presence of alcohol in fraternity houses over time has masked the true purpose of fraternities and created a subculture of parties and substance use. Understandably, many DU members feel the substance-free housing policy is an attack on the DU experience they know and love. However, what can be hard to see is that campus culture and student behaviors have changed dramatically from what most alumni remember. For a number of environmental, societal and generational reasons, alcohol and other substances now fuel the college environment, creating toxic cultures on many campuses. The National Survey on Drug Use and Health’s most recent report in 2016 shows that not only do college students consume alcohol at higher rates than those of the same age not in college, 1 in 7 young adults aged 18-26 suffer from an alcohol or substance use disorder. The National Institute on Drug Abuse also reports that the use of amphetamines in college-aged people has increased more than 30 percent in the last decade. Alcohol also continues to play a role in other risky behaviors on college campuses. Many of the recent high-profile hazing and assault incidents involving fraternities have also involved alcohol abuse. In these cases, over consumption has led to serious injury, even death. Looking at Delta Upsilon alone, 86 percent of Loss Prevention violations in the 2017-2018 academic year involved alcohol, and 100 percent of the Fraternity’s insurance claims since 2013-2014 have involved alcohol. Because of this risky behavior, fraternities are under attack. Beyond media coverage, colleges and universities have taken bold actions against entire fraternity/sorority communities. In the past year, more than 30 campuses have implemented some type of temporary suspension on Greek communities. Some institutions have questioned the need for single-gender organizations, while others have cut funding for their Greek Life offices. At the state and federal level, legislation has been proposed to curb students’ right to associate, with the potential to dramatically impact fraternities and sororities. The substance-free housing policy also draws on the Fraternity’s founding purpose and mission: Building Better Men. Since 1834, Delta Upsilon has existed to supplement one’s college education by providing additional personal and leadership development opportunities, whether through involvement in one’s chapter activities or the International Fraternity's educational programs. While beneficial, these efforts alone are not enough. To enhance learning and development, the Fraternity is now turning its attention to the environments in which that learning takes place. As of Oct. 30, 2018, 53 of DU’s 76 chapters/colonies have chapter houses, with 85-90 percent of residents being under the age of 21. Removing alcohol from chapter facilities makes the living environments for these men safer, freer from distraction and more conducive to learning. Feedback the Fraternity has received since making the substance-free housing policy announcement includes the notion that alcohol is a part of the college experience, and learning how to handle oneself and situations when consuming alcohol ties to DU’s Founding Principles of The Development of Character and The Diffusion of Liberal Culture. The Fraternity wholeheartedly wants to provide brothers with the opportunities to develop character and learn about how to care for others. DU also wants that to happen in safe and healthy ways that follow the law. The Fraternity recognizes that substance-free housing will not eliminate all risk. Students will still be able to access alcohol in other places. However, DU’s strategy is rooted in prevention and creating long-term culture change. The Fraternity believes having chapters full of men who joined a substance-free chapter will lead to better decision-making in all areas of Loss Prevention. All chapters shall eliminate the presence, consumption and use of hard alcohol within chapter housing at all times. The presence, consumption and use of beer and wine shall be limited to the private bedrooms of members who are of the legal drinking age. No alcohol will be allowed in common spaces of a chapter facility. During a social event, alcohol possession and distribution must be restricted to common spaces of a chapter facility for the duration of the event. There will be no consumption of alcohol in private living quarters during social events. Hard alcohol can only be provided and served by a licensed, third-party vendor at an off-site location. This means not at the chapter house or any chapter-related facility (e.g., annex). All chapters will have completed the transition to substance-free housing, including the removal of all alcohol and substances from private bedrooms. Alumni will have the opportunity to host up to six pre-approved events in common areas of the chapter facility per year with licensed third-party alcohol vendors. It is important to note these new policies do not mean that chapters cannot hold events with alcohol. They mean that by fall 2020, no alcohol will be present in chapter housing. Until then, the policies that took effect in August 2018 will help in the transition to substance-free housing. All events must remain in compliance with DU Loss Prevention Policy; national, state and local ordinances; host institution policies; and third-party guidelines. “Hard alcohol” is defined as any distilled beverage containing more than 0.15 alcohol by volume (ABV). “Substance-free” is defined as the elimination of the possession, use, distribution or consumption of all illegal and illicit substances, alcohol, tobacco, marijuana (regardless of state law) or controlled substances without an appropriate prescription issued to the user by a licensed professional. When making the decision to implement a substance-free housing policy, the Board of Directors analyzed statistical data of DU chapters/colonies to inform the decision. Utilizing chapter data from the 2017-2018 academic year, data shows DU chapters that already have substance-free facilities are some of the Fraternity’s strongest chapters. They remain competitive with other groups and excel in numerous areas. Last academic year, two of DU’s seven Sweepstakes Finalists, including the Sweepstakes winner, had substance-free facilities. Two more of last year’s Finalists have early-adopted the full substance-free housing policy beginning in fall 2018. The Board of Directors wanted to ensure that a substance-free housing policy would not hinder chapters’ ability to remain competitive on campus. While each university’s culture is different, and competitive parity cannot be standardized, the Board was satisfied with the statistics from DU’s chapters with current alcohol-free housing policies, which reflect a variety of campus types. The International Fraternity recognizes that chapters are not equipped to transition to substance-free housing or address substance use/abuse overnight and that policy-making alone will not change member behavior when it comes to alcohol. As such, Delta Upsilon is developing resources to not only help chapters with the transition, but also new curriculum to address alcohol and substance abuse. During the 2018 Leadership Institute, the International Fraternity began its educational programming around the substance-free housing policy. A panel discussion was held with all LI attendees, and multiple breakout session offerings for undergraduates and advisors addressed implementation techniques and best practices. Subsequently, at all future DU educational programs, similar sessions will be held regarding policy implementation. The International Fraternity has also committed to developing new educational curriculum regarding alcohol and substance use. This new programming will supplement existing Fraternity programs, including GreekLifeEdu, and will be designed in consultation with subject experts including DU alumnus Jason Kilmer, Washington ’91, one of the top minds on alcohol education in the fraternal community. Because each chapter has its own unique traditions, history and campus culture, DU understands transitioning to substance-free housing will not take a one-size-fits-all approach. Tailored approaches to each chapter will yield the greatest success. To spearhead this effort, Delta Upsilon has hired Dominic Greene, Oregon ’99, to serve as Director of Health & Safety Initiatives. In this role, his focus will be on policy implementation and working one-on-one with chapter members, advisors, alumni and campus officials to assist with the Fraternity’s new policies. This includes helping chapters adjust or phase out current activities or traditions taking place in the chapter house prior to fall 2020. Greene will also assist advisors and house corporations in revising leases and repurposing any existing event space within chapter facilities. Greene has an extensive background in higher education and the fraternity/sorority community. He has served as a campus-based professional, a past DU staff member and longtime volunteer, Vice President of Campus Operations for the North-American Interfraternity Conference, and as a trained speaker on alcohol education. During the 2018 Leadership Institute, chapters had the opportunity to meet individually with Greene to discuss the policy and implementation. This fall, Greene has been developing resources and traveling the country to host focus groups with chapters. As resources regarding policy implementation and educational efforts are developed, they will be shared with all chapters and available on the DU website at www.deltau.org/substance-free. For many years, Delta Upsilon has promoted values-based recruitment to members. This means selecting men for membership who reflect the core values and Principles of Delta Upsilon and choosing recruitment activities that mirror those values. For chapters to be successful in implementing substance-free housing, values-based recruitment will be more important than ever. Thankfully, the attitudes and beliefs of Generation Z (those born from 1995-2010) will be attracted to a values-based recruitment model and substance-free housing environment. Studies show that Gen Z students are coming to college less likely to engage in dangerous drinking activities, are more globally-minded and conscious, and are entrepreneurial, thus looking for a personal and professional development experience. Delta Upsilon is not alone in focusing its attention on providing healthy and safe environments for students. Several other fraternities (including Sigma Phi Epsilon and Beta Theta Pi) have also implemented or announced substance-free housing policies, and on Aug. 21, 2018, the North American Interfraternity Conference adopted a standard that will ban hard alcohol from all NIC fraternity houses by fall 2019. 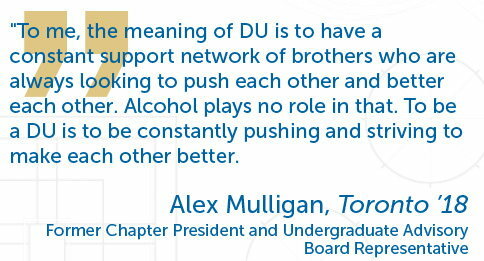 Community-wide changes will only enhance DU’s policymaking and educational efforts as more fraternities remove hard alcohol and other substances from chapter housing. Additional Health & Safety Standards from the NIC are currently being piloted and will soon be implemented on campuses across North America. Even non-NIC member fraternities, like Tau Kappa Epsilon, have announced hard alcohol bans that mirror the NIC standard. Delta Upsilon currently has 19 housed chapters that are implementing the substance-free housing policy. 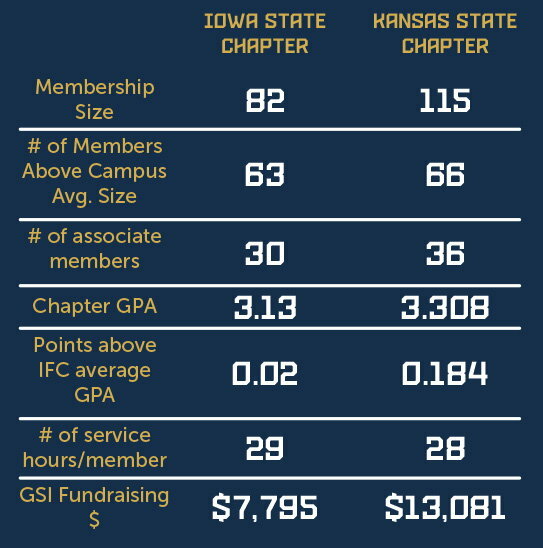 Data shows that these chapters are some of the Fraternity’s top performing groups. In fact, two of DU’s perennial Sweepstakes Finalists are thriving with substance-free housing policies within Greek communities that are not substance-free. The Kansas State and Iowa State Chapters prove that not only can DU chapters can still be competitive on campus (in recruitment, GPA, fundraising and more) with substance-free housing, but also that creating and maintaining a healthy environment are key ingredients to that success. Chapter President Joshua Robinson, Kansas State ’19, talks about the benefits his chapter has seen from having substance-free housing. What are some of the benefits the Kansas State Chapter has seen from being substance-free? I think the biggest benefit would be the environment it allows us to operate in. Our house is a place that allows us to study at any given time of the day. We don't have to worry about people being overly rowdy on a random week night. It has also allowed us to keep our house in a lot better condition since we don't have hundreds of college students over on the weekends. How has being substance-free has helped the chapter with recruitment? Typically, the first thing that potential new members and their parents point out is how much nicer our house is in comparison to others. We have a lot of PNMs complain about how bad other houses smell, stains on their carpets, holes in the walls, etc. Another thing that has helped with recruitment is the overall perception of the chapter. We try and recruit well balanced men: smart, athletic, motivated, and easy going. These guys usually appreciate the fact that they don't have to be around alcohol 24/7 and feel pressured to drink. This way, they can focus on the reason why they came to college, to get an education.